I hope you are all having a blessed beginning of this Easter season. 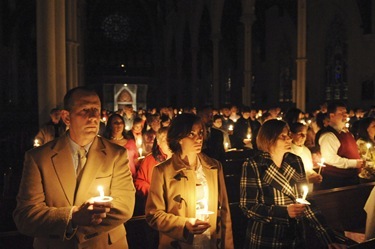 Our celebration of the Easter Triduum at the cathedral was wonderful and we have some very beautiful pictures that I want to share with you. 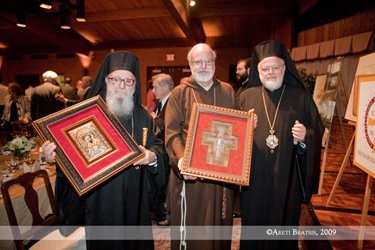 However, before I get to that, I want to mention what a joy it was to attend the 25th anniversary celebration for Greek Orthodox Metropolitan Methodios on Wednesday of Holy Week. 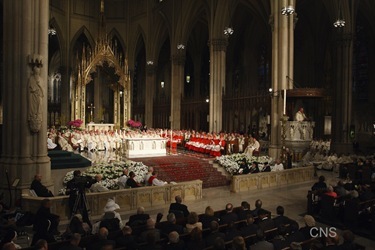 Though they had a liturgical celebration, unfortunately I was only able to go to the reception. There were several hundred people there and a number of community leaders, including Mayor Menino and John Silber. 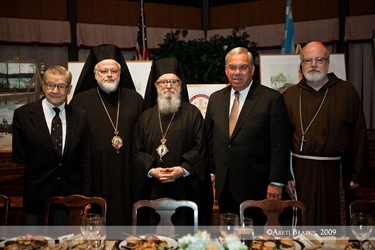 The head of the Greek Orthodox Church in the United States, Archbishop Demetrios, was also in attendance and gave the keynote. 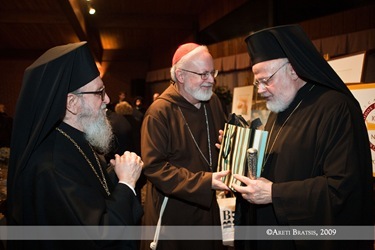 I presented Methodios with a replica of a 14th century stone reliquary that I brought back from Rome. He, in turn, gave me very beautifully framed San Damiano Cross. Our friendship with the Metropolitan has been very, very close. 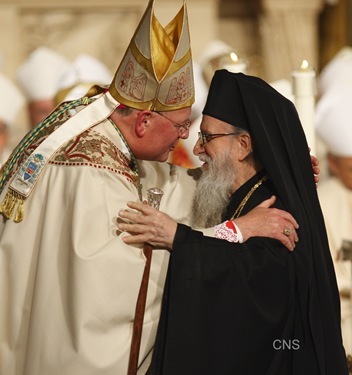 I thanked him for always standing with the Church, even in the most difficult times. I also thanked him for his leadership in the community and his great work on behalf of unity between our two churches. 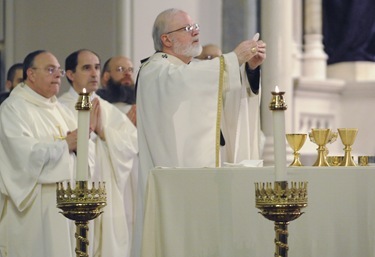 Holy Thursday we celebrated the Mass of the Lord’s Supper and the mandatum. 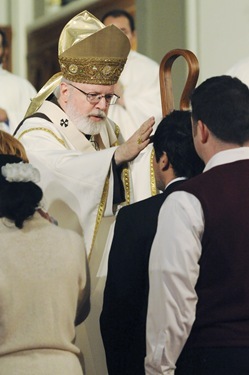 In my homily, I reminded people that in Jesus’ farewell address he gives us a gift and a command. 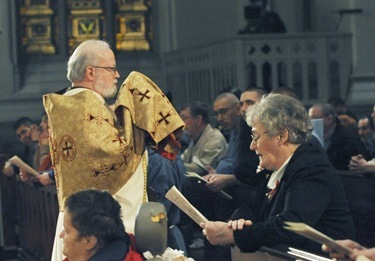 The gift is the Eucharist and the command is the New Commandment (mandatum novum) that we should love one another. 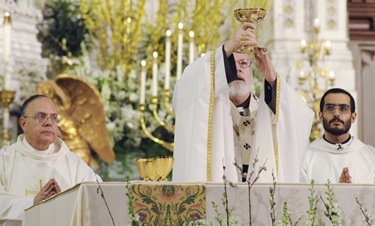 I said that it is in the Eucharist, where Jesus makes a gift of himself, that we find the strength to be able to live the new commandment of love. 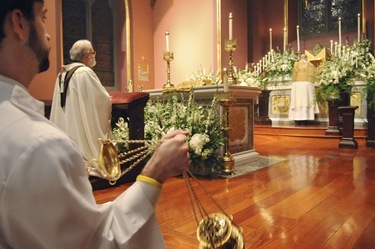 After the Mass, it is a custom to reserve the sacrament in the repository and hold a eucharistic vigil. We had a wonderful vigil at the cathedral and many of those attending were college students involved in local campus ministries. 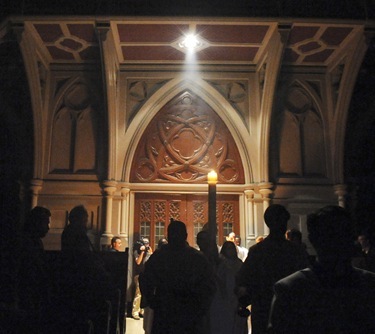 It was impressive to see that the chapel was standing room only until midnight! 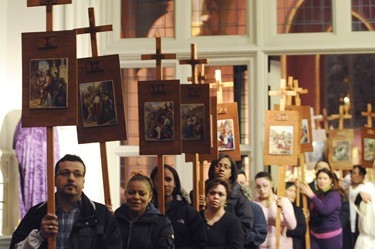 On Good Friday, around noon, we joined the last stations of the Way of the Cross for Life which prays the stations with a pro-life theme while processing through the streets of downtown Boston. There was a very good turn out this year. 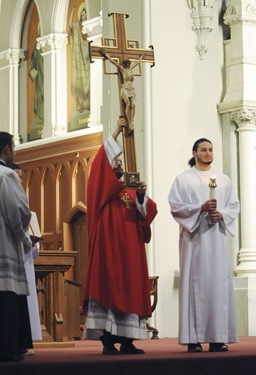 Then at 2 o’clock we also welcomed at the cathedral the Way of the Cross organized every year by Communion and Liberation. They start on Boston Common and walk throughout the city. They had a beautiful schola that sung for them and I preached on one of the stations for them. 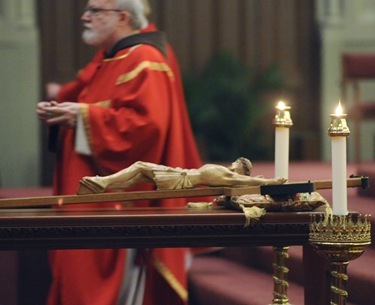 Immediately afterwards, we had our Good Friday services in English at the Cathedral and Father Romanus Cessario gave a reflection after the reading of The Passion. In the evening, I celebrated the services in Spanish. 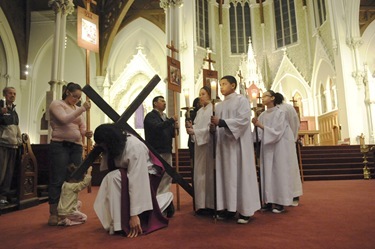 As always, we had the stations of the cross with someone representing Christ and carrying the cross. Most years we make the procession through the neighborhood around the cathedral but this year we did it indoors because of the rain. 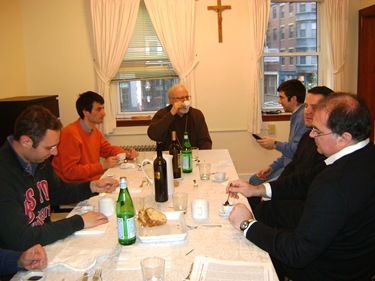 On Holy Saturday we had lunch with the Memores Domini, who are members of the lay association of Communion and Liberation, at their residence in the North End. 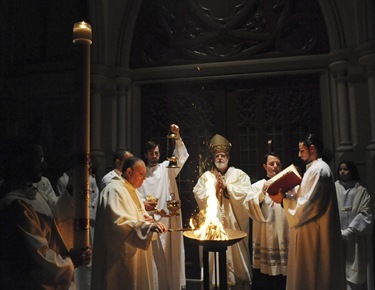 And then, of course, in the evening we celebrated the Easter Vigil. 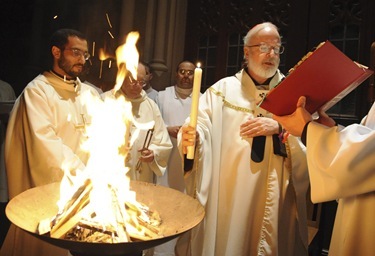 This liturgy is the most important liturgy of the year when we go through the history of salvation, with the blessing of the fire, the blessing of the water and the renewal of our baptismal promises. 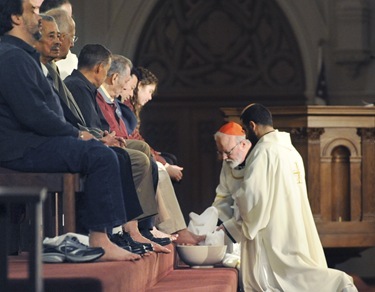 It is sort of the culmination of Lent — which is a baptismal retreat preparing us to renew our commitment as the Lord’s disciples in the Catholic Church. 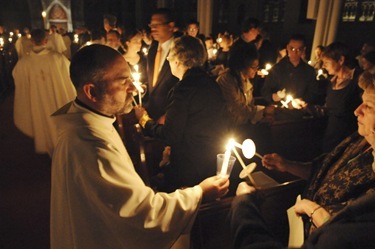 We were blessed to receive four people into the Church at the vigil, which is always a joy. Israel Rodriguez, our deacon, sang the Exultet beautifully and did a wonderful job. 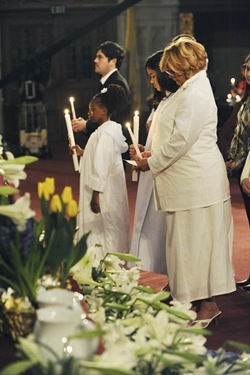 On Sunday morning I traveled to WHDH Channel 7 to celebrate the televised Easter Sunday Mass. We are grateful to all the folks over at channel 7 for their help and support through the years. 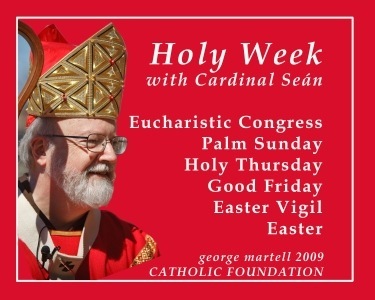 If you would like to see more of my Holy week activities be sure to watch this slideshow put together by George Martell of our Catholic Foundation. He was with me at many of my events week, documenting my activities. 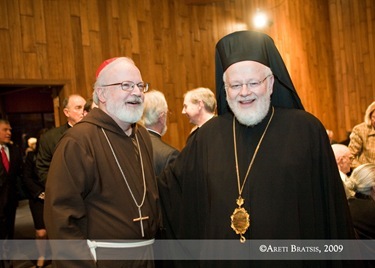 On Wednesday of this week I was happy to attend the installation of the new Archbishop of New York, Timothy Dolan. 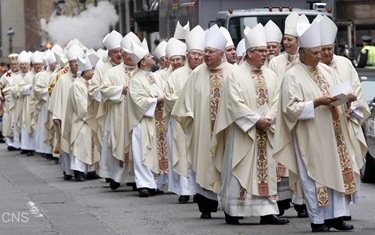 I think Archbishop Dolan will fit right in to the culture of New York. He is a very joyful man with a wonderful personality as well as a gifted preacher and communicator. 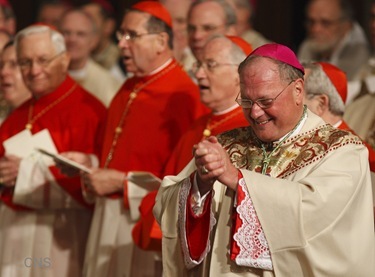 I knew him at the nunciature in Washington and then, later on, as the rector of the North American College in Rome. 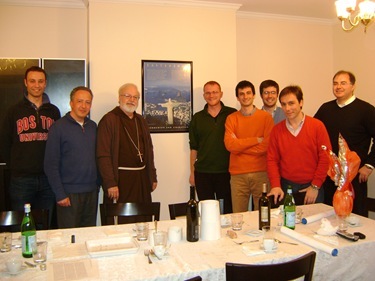 I sent a number of seminarians there precisely because he was the rector. 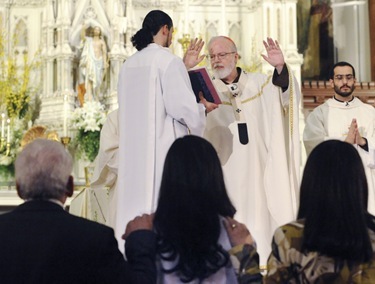 I had confidence in the formation he would give them and the sense of joy at being a priest he was able to communicate to the seminarians. He gave a lovely homily. Of course, the readings for the day were beautiful because it was the story of the road to Emmaus. He told a story about being in the Holy Land with a Franciscan friar who was showing him around. 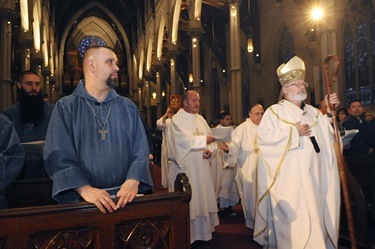 The archbishop said he asked the friar, “I want to walk on the road to Emmaus” and the friar responded, “Well, nobody really knows where that is. 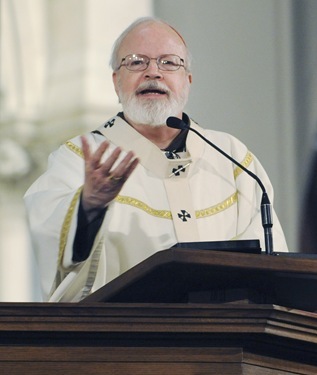 But, of course, the advantage to that is that any road can be the road to Emmaus for you.” Archbishop Dolan went on to talk about how Broadway or Fifth Avenue can be our road to Emmaus. 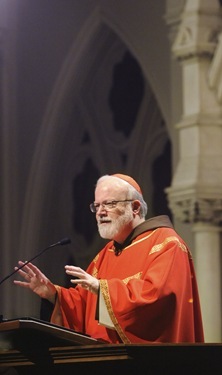 But then, at one point, he talked about Christ’s resurrection as being manifest in the Church in our defense of the unborn and there was an explosion of applause and enthusiasm. People jumped to their feet! I couldn’t help but to notice the politicians sitting in the front row. 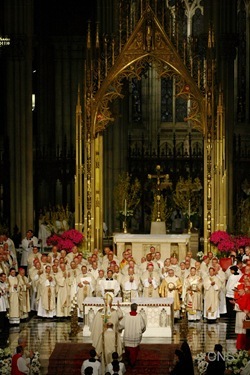 They stood with the rest of the assembly, but I thought to myself that its so good for them to see this, because many people want to give them the impression that Catholics really don’t care about abortion—that it’s just the bishops—but the response was wildly enthusiastic. I think the archbishop was even surprised by it. 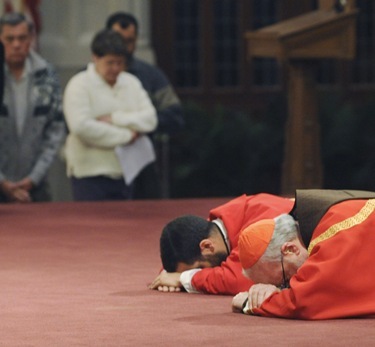 He even had to stop his homily because of the outburst. I think it shows that Catholics who love the Church, or practice their faith, are deeply identified with the pro-life cause. On the subject of great communicators, I’m pleased to say that I recently became a member of the episcopal board of advisors for the beatification cause of Archbishop Fulton Sheen. I was very honored to be asked to be a part of that group. For those younger blog readers who may not be familiar with Archbishop Sheen, here’s a YouTube video of one of his classic television programs. 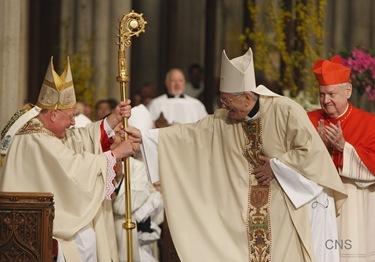 It was my privilege to have known Archbishop Sheen. When I was a child he would visit our parish regularly and I would often serve Mass for him. In those days, of course, the Masses were in Latin and ordinarily there was no preaching during the week — preaching was on Sunday — and then the lessons were in Latin. 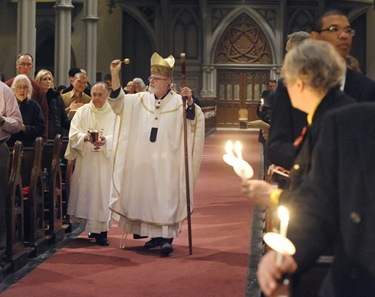 However, when Archbishop Sheen was at the parish during the week, the church would be standing room only. He would preach every day of the week, which was very, very unusual at the time. 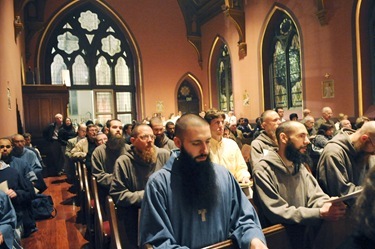 Later on, in 1975, I organized a preaching seminar for the Holy Year at Catholic University, in the Hartke Theater and we had about 600 priests come to it. The two speakers I had invited were Father Avery Dulles and Archbishop Fulton Sheen and, of course, they were both spectacular. Archbishop Sheen, at that time, must have been in his 80s, but he had not changed, he looked like he always did on television and was still playing tennis everyday. The only thing that shocked me, having not seen him since I was a child, was how short he was! But, he was a huge personality and a very important figure in the history of the United States. 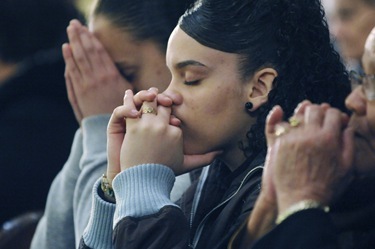 No one did as much to break down prejudice against the Catholic Church as Fulton Sheen. I always say that John F. Kennedy could never have been elected president of the United States had it not been for the television program and radio programs of Archbishop Sheen. He made thousands of converts during his life by his preaching. Of course, his main job was supporting the missions as head of the Propagation of the Faith. He did an extraordinary job at that. Archbishop Sheen was a very holy priest, and I think that his role in the history of the Church in the United States was a very important one. It would be wonderful to see him elevated to the altars. 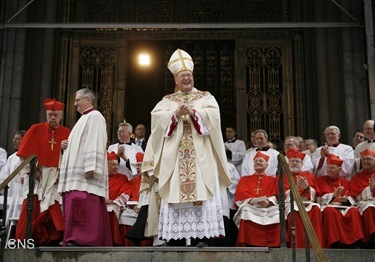 We have a new archbishop in New York who is also a great communicator and we hope that his ministry there will be like Archbishop Sheen’s that attracted so many people to the Church.